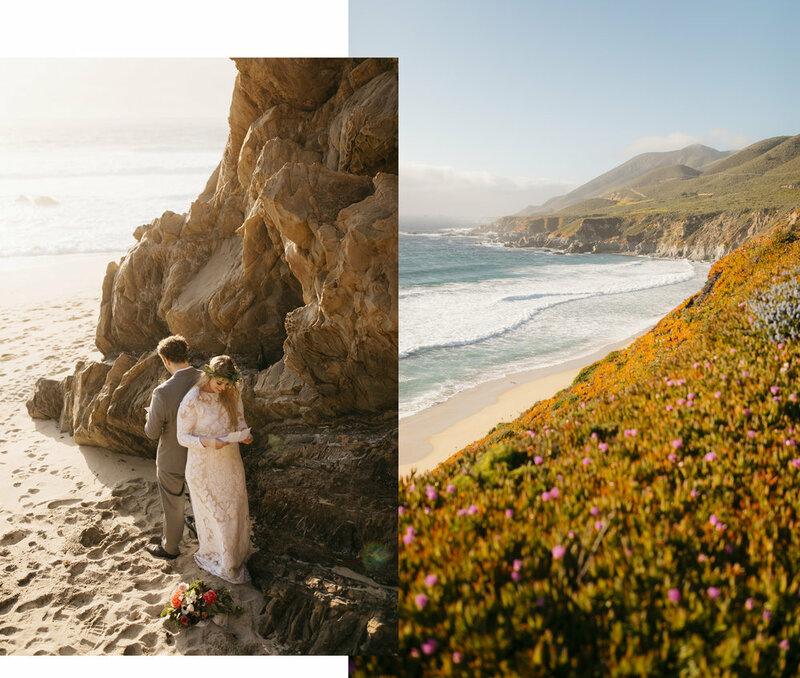 This spring we photographed Scott and Chandler’s adventure elopement on California’s gorgeous Big Sur coastline. We had a great time getting to know them; they are such beautiful and joyful people! We loved that they made the day exactly what they wanted it to be: fun, laid-back, and adventurous. We showed up at their hillside Airbnb rental as they were getting ready together. It was a beautiful thing to see them helping each other prepare for the rest of the day. Before leaving for the ceremony they did Face-time calls with family back home. Squeals of delight and words of encouragement came from the other end of the line as they saw Scott and Chandler all dressed up. A quick drive down the coast and we arrived at Garrapata State Park for their elopement ceremony. Along with the officiant, we ventured out among wildflowers to the edge of a cliff where they said their vows and were pronounced husband and wife. Then we made our way down to the beach and they read emotional letters they had written for each other and popped some champagne. After playing on the beach for a little while we made our way to one more beautiful cliffside. Scott and Chandler cuddled up watching the waves crash along the shoreline as we took a few more photos before the sun had completely set. “Before Scott and I got engaged, we frequently discussed our ideas of what the perfect wedding would be like for each of us. Scott and I love to travel; we've traversed mountains in Canada, breathed in the fresh forest air in Tennessee, and braved the crazy altitudes in Colorado. We are so thankful that we have been fortunate enough to travel whenever we want to; I take care of leukemia patients who rarely get to leave the hospital once they're diagnosed. It's a tough battle to witness, but they are so strong. They have shown me how to truly make the most of life and to appreciate every opportunity that I am given to do something that makes me happy. Being with each other and getting outside are two things that make Scott and me really happy (haha). At the end of the day, that's what really matters about your wedding day... spending that time really bonding and enjoying the special moments you won't get again are part of what makes eloping so great! I will say that once we were engaged, Scott and I thought about just going to the courthouse to become husband and wife as quickly as we could! However, we started thinking about all of the people who can't go and see this beautiful world we have... and we are always down for a big adventure. Why not make our wedding day an adventure too? Traditional weddings are awesome, but Scott and I wanted to spend that day doing things we love together. On our wedding day, we had a big breakfast, hiked, and spent quality time together getting ready. Doing that was so intimate and special; a time I know that I will treasure for the rest of my life. I think eloping always made sense to us because we didn't want the craziness of a large wedding in a typical venue. We just wanted to be with each other and with nature, where we feel most at home. Want more information about our adventure elopement photography services?